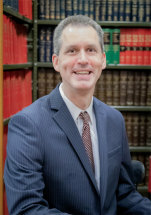 Matthew J. Cate joined Barber, Segatto, Hoffee, Wilke & Cate in 2001 after having clerked at the Fourth District Appellate Court, based in Springfield. He graduated from Southern Illinois University School of Law in 2000. Matthew became a partner with the firm in 2007. He concentrates his practice in estate planning, real estate, structured settlement payment rights and transfers, bankruptcy and creditors rights, and family law. He is a member of the American Bar Association, Illinois State Bar Association, Sangamon County Bar Association, and is a past President of the Sangamon Valley Estate Planning Council. He is also frequently appointed as a guardian ad litem by the court in necessary matters.